Jose Antonio Llueca Abella, David Martinez-Ramos, Javier Escrig-Sos, Ana Torrella-Ramos, Jose Luis Herraiz Roda, Ana Serra Rubert, Raquel Queralt-Martín, Jose Luis Salvador Sanchis, Enrique Calpe Gomeza. 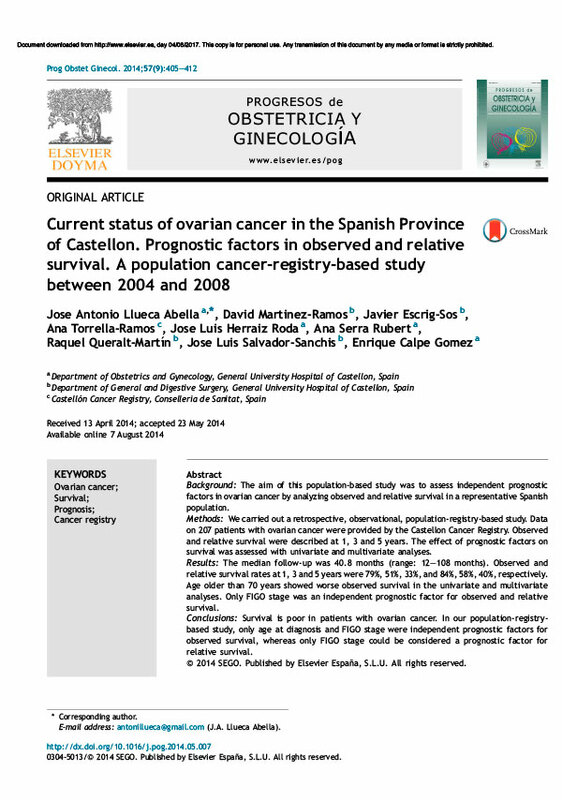 The aim of this population-based study was to assess independent prognostic factors in ovarian cancer by analyzing observed and relative survival in a representative Spanish population. We carried out a retrospective, observational, population-registry-based study. Data on 207 patients with ovarian cancer were provided by the Castellón Cancer Registry. Observed and relative survival were described at 1, 3 and 5 years. The effect of prognostic factors on survival was assessed with univariate and multivariate analyses. The median follow-up was 40.8 months (range: 12—108 months). Observed and relative survival rates at 1, 3 and 5 years were 79%, 51%, 33%, and 84%, 58%, 40%, respectively. Age older than 70 years showed worse observed survival in the univariate and multivariate analyses. Only FIGO stage was an independent prognostic factor for observed and relative survival. Survival is poor in patients with ovarian cancer. In our population registry based study, only age at diagnosis and FIGO stage were independent prognostic factors for observed survival, whereas only FIGO stage could be considered a prognostic factor for relative survival.